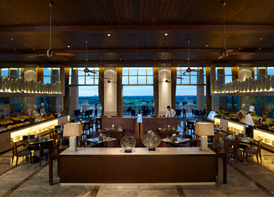 Mission Hills restaurant in Haikou offer a wide selection of international cuisines in the most refined ambience. The Ukiyo Japanese restaurant featuring a variety of culinary delicacies; Bistro On The Rock serving an extensive menu of local favorites and international specialties; The Onxy Lobby Lounge offering a fusion of East and West snacks, wines and evening cocktails in a cozy ambience. Our inimitable dinning experiences are sure to impress the most discerning taste buds. Chinese restaurant serving dim sum, Asian delicacies, and signature dishes from the different regions in China. It is ideal for corporate functions or family events. A comfortable dining environment, serving local specialties and Asian delights. © Copyright 2012-2013 Mission Hills China. All Rights Reserved.